This is the third installment of “Rereading Akunin” focusing on The Winter Queen. For the introduction to the series, and subsequent installments, go here. In a roundabout fashion, The Winter Queen reminds me of the opening section of Andrei Platonov’s unwieldy masterpiece Chevengur (that’s the Russian title—the English title is Chevengur). That section is called “The Origins of a Master” (“Происхождение мастера”); оriginally published separately, it refers either to the life of a tinkerer named Zakhar Pavlovich, or to the same man’s role in the development of the novel’s main protagonist, his adopted son Sasha Dvanov. The commonalities have nothing to do with subject matter, and certainly not with style (Akunin is seductively readable, while Platonov is seductively not). But both “The Origins of a Master” (through its title) and The Winter Queen (through its plot and its placement at the beginning of the Erast Fandorin series) seem to flirt with the idea of the Bildungsroman while deliberately failing to commit. Recall that the pleasures of serial fiction are about familiarity and variation, both of which are necessarily absent from the initial installment. Some series introduce the hero fully formed; if you read them out of order, the hero doesn’t seem all that different in the first book from the seventh. They might age, and might have accrued Important Life Events (for superheroes, that usually means dead girlfriends stuffed into refrigerators), but they emerge full-grown from the author’s brow, like Athena, and with Athena’s propensity for dispensing wisdom while racking up high body counts. Earlier I (favorably) compared The Winter Queen to the superhero origin story, a tale that usually inaugurates a sequence of endless adventures. But something becomes clear from rereading Fandorin that would not be evident from reading him in order for the first time: The Winter Queen is less a first installment than it is a prequel, even though prequels are usually written after the main novels. From this point of view, it functions like the second half of The Diamond Chariot, which finally fills us in on an important period of Fandorin’s life between Murder on the Leviathan and The Death of Achilles, or like some of the stories in The Jade Rosary. The Winter Queen obviously stand on its own, but the greater pleasure comes from the contrast between the young Erast Petrovich in this book and the mature Fandorin of the fifteen that follow. In The Winter Queen, Fandorin is young, naive, but not exactly guileless. He has good instincts without the experience to guide him. And he closes in on the actual crimes through an intriguing combination of intelligence and luck. In this chapter and the one that preceded it, Fandorin comes close to being a cypher: people speak to him because they continually fail to identify him as the police officer he actually is, underestimating him because of his youth and manner. As a result, people tend to open up to him. We see this most particularly in Chapter 4, where he allows his hostess and her guests to assume he is merely an admirer, who seems to just get caught up in the action. In his early days, Fandorin verges on the territory of Chauncey Gardner, Forrest Gump, and Zelig: the man who is in the right place at the right time. But if we place him squarely in their company, we are just as deceived as his interlocutors. His encounters are not random, but the result of patient detective work, following a man here, looking for a woman’s address there. He is most like a detective when he is operating alone; it is when he talks to others that his success stems from a combination of his ability to blend in with the background and his acute sense of when it is best to be quiet. His youth and naivety are most evident in his encounters with women; perhaps it is the charm of his hidden Lord Byron corset, but he seems to fall in love with every woman he meets. Even this will work to his advantage. Amalia Kazimirovna Bezhetskaya certainly captivates him (if last chapter’s young lady was nicknamed “Lizanka,” this one he mentally christens “Cleopatra), but her assumption that he is yet another lovesick admirer leads her to act with a bit more candor than she would if she thought he were a savvy investigator. At this point, we don’t know just how lucky Fandorin will turn out to be. But Erast Petrovich’s modesty has a metatextual element to it. Fandorin is preternaturally lucky, a quality that will stand him in good stead throughout his adventures. 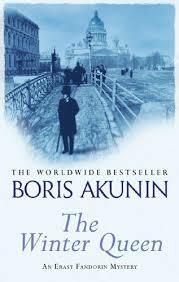 But Akunin is letting us know that this luck is a matter of honor; in terms of plotting, this means that Akunin will not use Fandorin’s luck indiscriminately, and therefore will not cheapen the mystery plots by simply allowing Fandorin to stumble upon the truth. But at this point in Fandorin’s career, he can use all the luck he can get. Fandorin follows the slouching student to Moscow University, where a doorman reveals his name: Nikolai Stepanich Akhtsyrtsev, the executor of the late Kokorin’s will. He follows Akhtsyrstev to a shop, where he meets the beautiful Amalia Kazimirovna Bezhetskaya. Fandorin follows her to her house, tries to get information out of the yard keeper, but is immediately betrayed to John, the English butler, who is about to evict him from the premises when Amalia Kazimirovna comes by and invites him to her evening soirée (“But wear tails”). The men, including Akhtsyrtsev and someone named Hippolyte, are all vying for her attention in a scene that is vaguely reminiscent of Nastasya Filippovna’s party in Part One of The Idiot. They play the game described above, Fandorin goes off with Amalia Kazimirovna, and just as he asks her about Lady Astair, Hippolyte and Akhstyrtsev get into a fight. Hippoyte is banished, while Amalia Kazimirovna implores Fandorin to take Akhtsyrtsev home (“You are the only one here who is anything like a man”).